Palau, March 24 (CNA) President Tsai Ing-wen (蔡英文) on Sunday headed to Nauru, the second leg of her current eight-day visit to diplomatic allies in the Pacific, where she will hold talks with President Baron Divavesi Waqa, address the parliament and witness the signing of a sea patrol cooperation accord between the two countries. After having breakfast with her Palau counterpart Tommy E. Remengesau Jr. and Palau's traditional leaders, Tsai concluded her visit in the country and departed for Nauru. She and her entourage are scheduled to arrive in the country around 7 p.m. Sunday (local time). Before her departure, Tsai said on her Facebook page that Taiwan, the United States, Japan and Palau are staunch strategic partners in the Indo-Pacific region and her visit to Palau was aimed at discussing bilateral cooperation with the country and strengthening the multilateral relationship in the region. Tsai said it cannot be denied that Taiwan and many allies share abundant resources in the Pacific and Taiwan is willing to make great contributions and work with its allies to protect the common achievements of freedom and openness in the region. She said that the purpose of her overseas visit include maintaining interactions with allies and demonstrating Taiwan's care for the international community and its desire for international participation. During her trip to Nauru, Tsai will meet with Nauru Speaker of Parliament Cyril Buraman at a luncheon, visit the Naoero Museum, offer encouragement to the orthopedics team from Taiwan's Taichung Veterans General Hospital and attend the opening ceremony of the Taiwan Agriculture and Livestock Education Center established by the Taiwan Technical Mission in Nauru. She will also visit the Boe Declaration Memorial and witness the signing of a bilateral coast guard cooperation agreement between the two governments. The memorial was established during the 2018 Pacific Islands Forum to mark the signing of the declaration by Australia, New Zealand and Pacific nations. The Boe Declaration highlights climate change as the greatest threat to Pacific people and acknowledges additional collective actions are required to address new and non-traditional challenges, including climate change. The declaration also committed all forum countries to meeting their Paris climate change agreement targets. After her Nauru visit, Tsai will head to the Marshall Islands Tuesday. She is expected to make a U.S. stopover in Hawaii before returning to Taiwan Thursday. 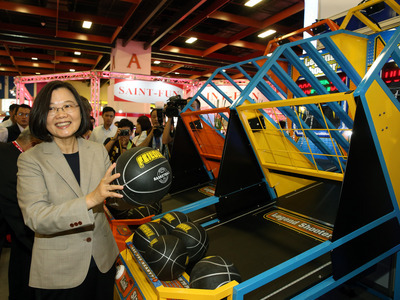 This was Tsai's sixth official trip abroad and second one to the Pacific since taking office in May 2016, following the visit to Marshall Islands, Solomon Islands and Tuvalu in October 2017.